2015 – The year of the Dog.. Okay, so Ferocious Dog have been around a little longer – but this last year has felt rather like a landmark. And not just because back in February it’s when Ferocious Blog was born, ha! The lead up to a new year is traditionally a time for reflecting back on the year just gone and looking forward to the next one, so I figured it’d be nice to trawl back through the months and pull out a highlight or two for each month of 2015, it will be tough to pick just one or two so feel free to chip in your own in the comments – despite my best efforts I didn’t quite make it to every Ferocious Dog gig in the year! 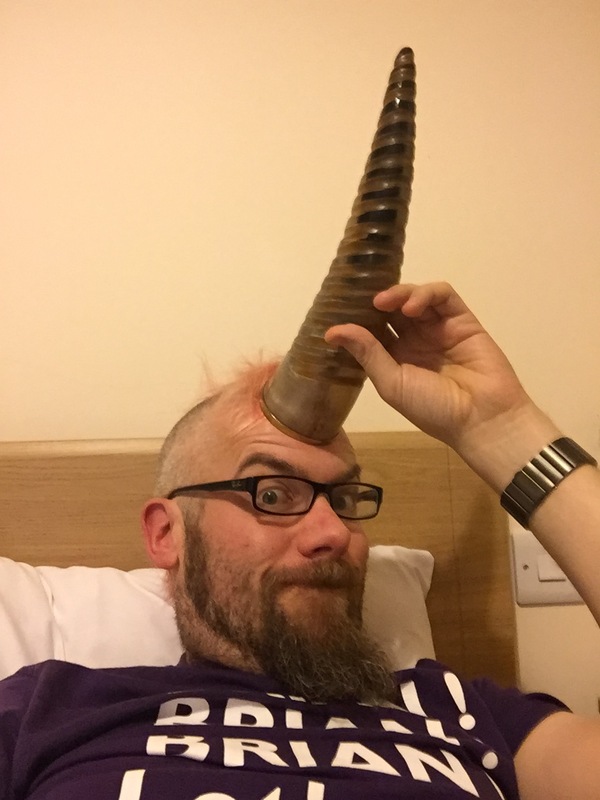 January 2015 – a light month, Ferocious Blog was yet to be created (although it had been an idea kicking around in my head for at least a couple of years). Checking my calendar and personal blog doesn’t reveal much at all in the way of Ferocious Dog activity – we’d have been still basking in the warm glow of Dogfest back in December – I latterly discovered that a 3 Piece Acoustic performance took place in honour of Ella’s 21st birthday in this month, but alas I didn’t know Snotty at this juncture! 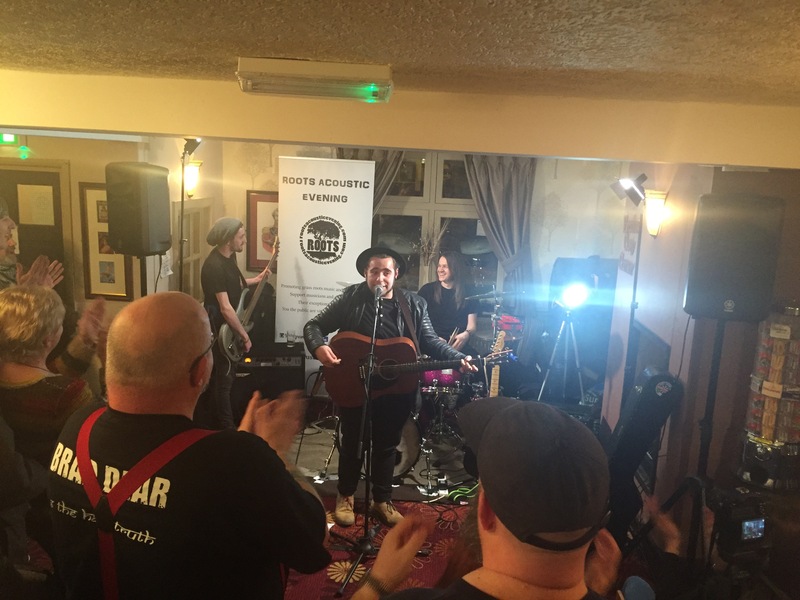 February 2015 – the blog is born after an acoustic appearance by Ken and Dan at the Brown Cow in Mansfield. Seldom has one of Sam’s nights had such a huge crowd packed in. The demand for the event was the perfect excuse to arrive early and chat nonsense with friends for the afternoon. An afternoon of drinking had taken its toll on Dean who for the first time decreed I needed to get up and surf in his place – a great way to start what became a year of extreme ‘dogging’. These smaller intimate gigs are as enjoyable for me as the bigger and bolder shows that are to follow. We were first introduced to Scott at this appearance too. My yearly stats tell me this is my hundredth post on Ferocious Blog which of course was born back in March this year – so not a bad rate of updating. 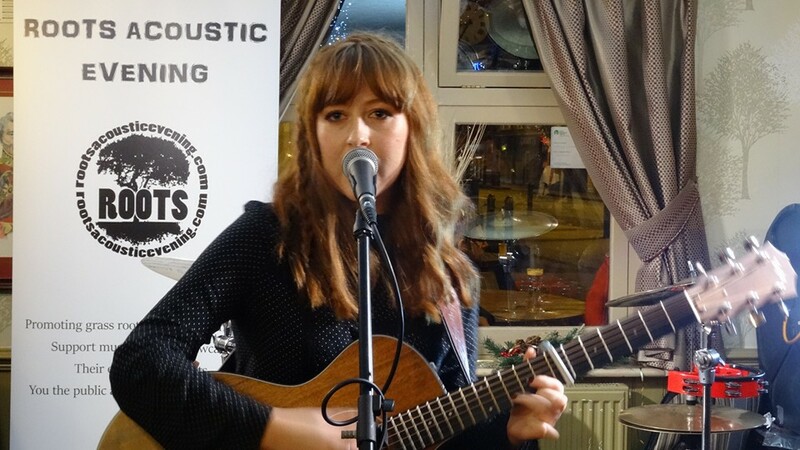 It was to Eastwood that Ella and I headed for our last gig of what’s been a very busy year to see Brad Dear supported by Kate Auburn, Joseph Knight and until childcare issues put a spanner in the works a certain Ken Bonsall. 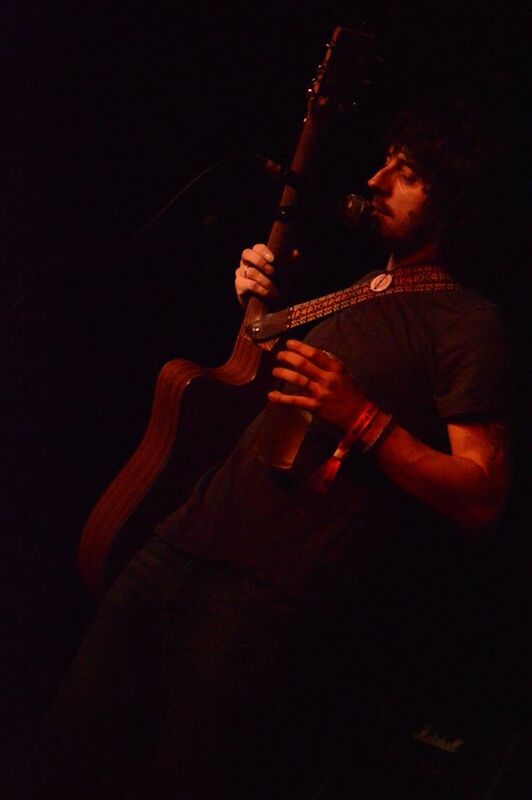 Whilst of course it’s always nice to see Ken perform, it didn’t take away from a cracking evening’s music. Chris organises Roots Acoustic Evenings every tuesday up at the Wellington Inn in Eastwood – normally tuesdays don’t normally work well for me, but in the limbo period between Christmas and New Year gave me the chance to get up there for what turned out to be a splendid gathering of friends to enjoy the musical fayre on offer. With work in the morning I was driving and found a parking space right outside the pub which is always a bonus! First up was Kate Auburn, she took to the stage with her guitar and launched into Jolene which was a nice way to get the crowd warmed up with something familiar. The bulk of her set was made up of original songs though – lots of delicate guitar picking overlaid with a great voice – she’s already confirmed for Ey Up Mi Duck festival so I’m looking forward to seeing her perform again. Let Me Go, Morning Light and Me and You were stand out tracks then the set was finished up with a cover of Girl from the North Country by Bob Dylan. Let’s get Maelor’s album made! I am a fan of crowd funding full stop – I’ve backed a few projects over the last few years since it became a thing online, some have been awesome, a couple have proven a bit disappointing, one or two ended up with refunds as they didn’t come to fruition, nearly all of them have been wildly optimistic with their delivery dates! It’s a bit of a gamble, but it gives the creator of the product a bit of cash up front to be able to get their project underway and fulfilled. Of course, more recently Ferocious Dog used this mechanism for their latest album and indeed the live CD/DVD recordings at Rock City. For an artist operating outside the mechanism of a record label who can front cash for recordings, pressings and printing then for me it’s the future of independent music releases. So it’s in that vein that Maelor Hughes is finally mobilising to get a long overdue album sorted – and he’s reaching out to fans to help him with finding the cash to get it sorted – there’s a number of levels of backing you can give him in exchange for different rewards – which I’m quite excited about – I’ve got a few disparate EP releases from Maelor but it’ll be good to get an album. On that note – he recently put out a new three track EP called Maybe Over Time which you can get a download of for the princely sum of just £3 – that’d be a good starting point. Then check out the crowdfunding campaign and see if you fancy getting involved. 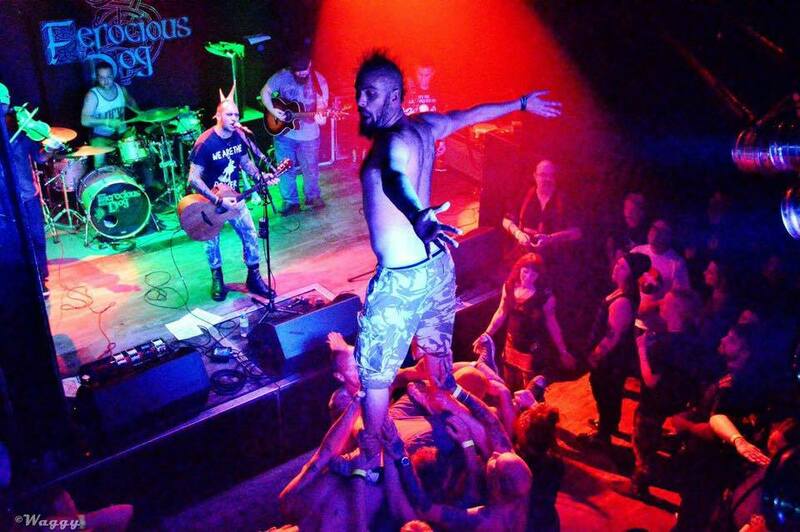 Those of you who’ve followed Ferocious Dog for a while are highly likely to have had the pleasure of seeing Maelor supporting them so you’ll know what an ace songwriter and performer he is – those of you that haven’t, hit YouTube! There’s a common phrase that behind every great man there’s a great woman – of course, ignoring the simplistic assumptions around sexuality and dated notions around gender-equality it’s a nice sentiment. 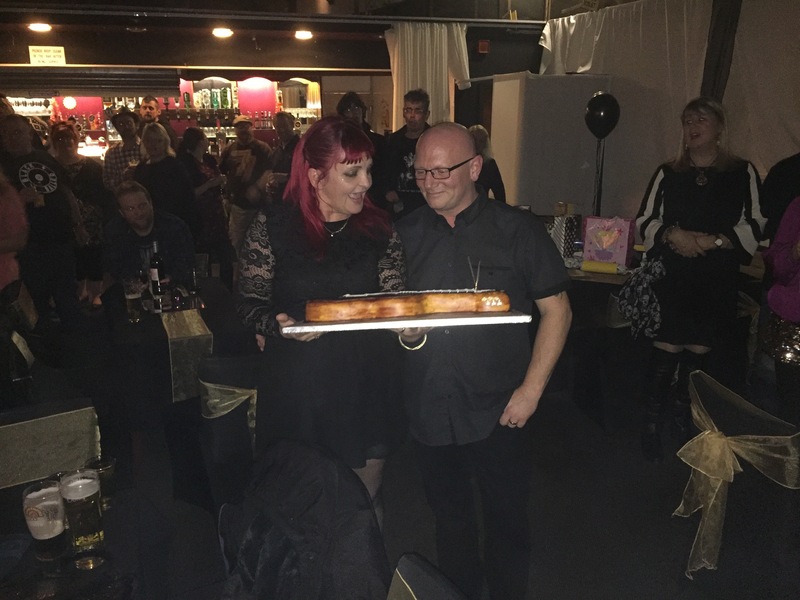 The reason it sprang to mind when finally getting around to write about Drew’s 50th birthday bash which happened last weekend is that he and Adele kinda turn that on its head. Whilst Nana is the public face of the kitchen that bears her name, Drew is the ever-dependable dude there too. Anyway, I digress. For months Adele had been plotting a surprise party for Drew to be hosted at the Black Market Venue in Warsop. Why I’ve felt compelled to write about a private party on here is that every person in the room bar one, indeed, the room itself, were only known to me either directly or indirectly because of Ferocious Dog. Folk met at gigs or festivals all of which I attended because of the spark the band provided and ignited me into a sometimes non-stop gig and festival going machine. We had arrived in Warsop early – I’d picked up Ella and Dave from Loughborough station and after a tea stop at home we headed straight up there via grabbing Andy in Clifton. So there was time aplenty for chat with the other attendees before we were ushered into the main hall at the back. It’s been lovingly redecorated since I last went and we were soon all clustered behind the curtain in front of the main stage. Drew was ostensibly just being taken for a drink in the bar area with a few local folk ahead of a trip to Nottingham the next day to see The Bar-Steward Sons of Val Doonican. The not so Jingle Bell Ball..
Just how do you follow up a sell-out show these days? Well, two consecutive sell-out shows in Kenny’s case, well – Ken and Dan gave up their time for free to support a charity event set up by Georgi and Heather from Chesterfield College. They were raising money and awareness for FairPlay, who support children and young adults with disabilities or other needs across the North Derbyshire area, as part of their Health and Social Care studies. So far their fundraising total is over £900 – which is awesome, huge well done! I didn’t think I was going to be able to make it to the event at Chesterfield’s Proact Stadium but as work took me to Leeds on the day it seemed like providence as that made the gig pretty much on the way home. So upon leaving our office just north of Leeds into the mysterious and misty weather it turned out the M1 was a bit of a nightmare – my sat nav came up trumps and diverted me round the back of Meadowhall and through a labyrinthine route around the backstreets of Rotherham and Sheffield to eventually spit me out on the road to Chesterfield past Dronfield. Now as a proud Stag being asked to play at the home of the Spireites is a big ask for Ken. 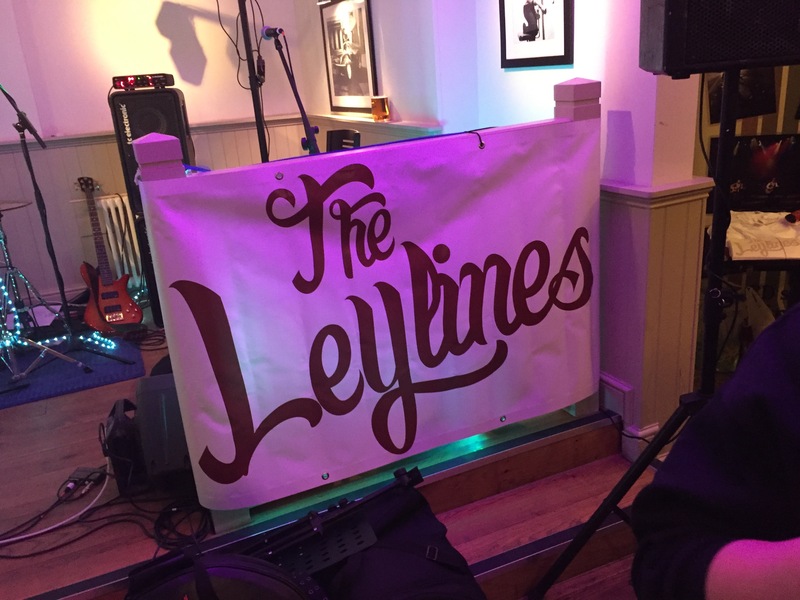 It’s a new ground so it’s very shiny – and The Spires restaurant is a cracking venue, it was going to be a bit odd being at a Ferocious Dog gig – albeit a two-piece one – and sat in dinner party table arrangements! Whilst Ken and Dan were sound checking I settled on a table with Karen, Bev, Emma, Jamie and Dylan – it was good to have a natter, and coo over Lacey-Lee a bit who was with Leanne and family on the next table. True, Fast and (mostly) balanced.. Nights like last night are the kind of occasions that you simply won’t forget – to coin a phrase from one of the acts in question, I can’t stand the thought of lying on my death bed with regrets, but I’m pretty sure this evening’s fun and games will be one that I relive when that time comes. Okay, a bit morbid, sorry. For a mere £8 something Andrea had bagged not just Funke and the Two Tone Baby and Gaz Brookfield, but Maelor Hughes and Ken Bonsall in a Ferocious Dog one-piece guise too. Any one of those acts in my admittedly slightly biased opinion are worth that fee – throw in a bonus song from Brian Stone, the awesome Rock and Blues venue in Barnsley and friends too numerous to count in attendance and I don’t think I’m exaggerating at all to say it’s one of my favourite gigs of this year. Ella and I headed up to Barnsley from Loughborough and had treated ourselves to an inexpensive Premier Inn room a ten minute stagger down the road, and were soon battling through the wind to get there. Upon getting into the venue and wrist banded up it was already pretty full of familiar faces, we had plenty of time for mingling and getting a few drinks down us before the doors to the venue proper were opened. Maelor was up first with a slightly poorly throat – it didn’t take away from a top opening set though, Morning Sun was the second song in, by the time he’d moved into Better Day the crowd were already shouting the ‘Oi Oi’ bits without him asking them to, he treated us to Won’t Fight Your War before offering us the bonus of a guest appearance. The day for us started in Doncaster post-Levelling. We’d arranged to meet Becky, Pete and Rachel in a Toby Carvery for a spot of all you can eat breakfast. Unfortunately we hadn’t clarified brilliantly which one, so the Hotel Campanile crew all piled into the wrong one – a quick google later we’d located the right one and headed there for a plate full of greasy goodness to stave off potential hangovers. It was a nice way to start the day off reminiscing over a great evening, not least updating the non-Campanile folk of cheese-party disclosures. Best still, as a potential neat sideline for the MeadEvil bar, Pete had been sourcing some drinking horns – after expressing my excitement about owning such a vessel they very kindly gifted one to me. So that shall be making plenty of appearances at festivals next year – mmm, meeeead! I just need some kind of holster for it, or maybe my Dogfest lanyard thing will do the job! Perhaps I should’ve thought a bit more about the photo I posted on Facebook that John must’ve spent all of five minutes gleefully ‘adjusting’ with, well, I was going to say Photoshop but I think it might’ve been MS Paint – haha! I’ve not used that picture in here! Then for Ella and I it was time for goodbyes and hitting the road to Weston-Super-Mare via Donny station where Andrea joined our merry road trip to go to The Leylines christmas party. We had a pretty clear run all the way down, arriving at the windswept town with plenty of time to get checked in. Andrea’s hotel had free parking so we used that – she checked in to Room 101 initially, but swapped it for one with a sea view, in the meantime we were just round the corner in a different hotel which was pretty comfortable too! Of course being in dire need of a rest from a fairly relentless few months of going to gigs, what better way to wind down from the crescendo of last weekend than going to see the Levellers on their Beautiful Nights mini-tour last week? Ha. After finishing up work Ella and I hotfooted it up to Doncaster to check in to the slightly sinister Campanile Hotel which is right next to the venue, and looks a bit like an American motel with the rooms in a block on two levels separate from the reception and bar area. As well as us numerous friends were also staying there – Dave, Caroline, Dave, Nadine, Naomi, Kev and Magz. Dave and Caroline were already there, and once we’d got ourselves sorted the first order of duty was to head round to nearby Brewers Fayre for some drinks, socialising and food. Eventually everyone had arrived including Becky, Pete, Rachel so we headed on over to the venue shortly after it had opened – and well, frankly it was a riot of people we knew which was great. 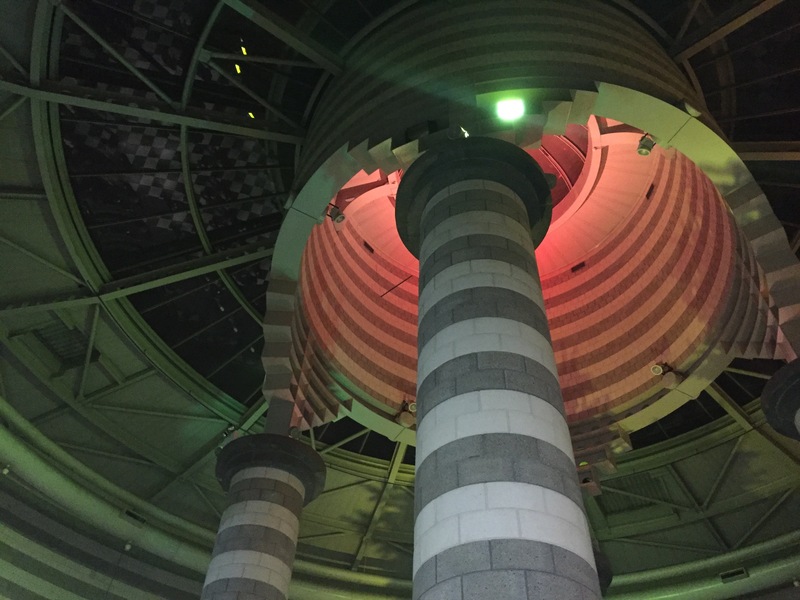 The Doncaster Dome is an interesting venue, a multi-functional space you’re assaulted immediately with a chlorine smell from the swimming pool, enticed tantalisingly by a children’s play area as you head to the dome itself and descend to the floor level which housed a bar and the merchandise stall. I resisted a splurge and instead just nattered to the countless friends assembling – the sound insulation was pretty good too as by the time I’d thought to check the time I’d managed to miss Ruts DC which was a bit annoying – I’ve seen highly appreciative comments on Facebook about their set. Dogfest 2016 – going, going… gone! If you blinked you might’ve missed the window of opportunity for ordering tickets for Dogfest 2016 which went on sale shortly after the Rock City gig. Dan announced on Facebook he was putting on sale the remainder of the tickets for the event on 13th February 2016 – which will once again be hosted at The Black Market Venue in Warsop – and it’s now officially sold out in a matter of days. The line-up is all but confirmed – with one slot remaining for prospective bands to vie for – there’s been some amazing suggestions on the thread in the Facebook group already, so if any of those are successful in getting the final place it’ll be a fine addition to what is already a stellar line-up. Gaz Brookfield isn’t available for the date sadly, although y’know, you need to mix it up a bit – he’s done the last two Dogfests after all! Quite a change from the first Dogfest I attended back in 2012 – that definitely wasn’t a sell out, and my own attitude was less committed too. We hotfooted it up mainly to see Ferocious Dog finish the day off having been at the football in the afternoon. Fast forward to 2013 and there was merchandise and a lot more people, 2014 I think was sold out and amazing, of course 2015 was skipped to make way for Rock City and a change of date for February in 2016. 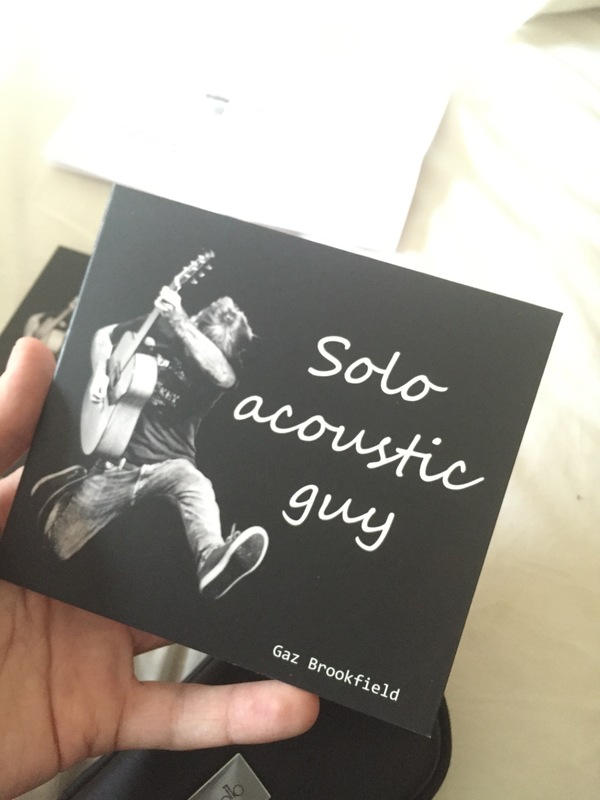 It’s no secret on these pages that I’m a huge fan of Gaz Brookfield – his latest recorded offering Solo Acoustic Guy landed on my doormat on the day he played Rock City along with Mad Dog Mcrea and Ferocious Dog providing me with the perfect soundtrack for heading on into Nottingham. It’s a product of an agile musician – announcing the idea, canvassing Facebook fans to choose tracks, recording, producing and sending within a few weeks. This CD straddles the divide between a studio and live recording – recorded in a studio, but in a one-take live style. The promise of mistakes, bum notes or forgotten lyrics being included – a warts and all exposé of an artist clearly not feeling too vulnerable with being able to deliver the goods. Bearing in mind that by the time this was being laid down he was probably already starting to suffer from the lurgy that rendered a couple of FD’s dates sadly Gazless. For a mere tenner (or more, if you feel generous) you’re treated to nineteen tracks chosen by frequency of comments on his Facebook page, with enthusiastic levels of suggestions from his back catalogue. Ella and I made it our mission to get Glass Half Empty on there – even though I reckon we are the only ones who put that one forward we were delighted to see it there nestling on track fifteen amongst the other selections people made.